PsyArXiv Blog – Open-access preprint service for psychology. When you create something, you are its legal owner (i.e., you hold the copyright) until or unless you give it to someone else (e.g., a publisher) or place it in the public domain. Under fair use, other people can legally copy portions of a non-public work without getting permission from the copyright holder for purposes like teaching and criticism or commentary. A license is a means by which a copyright holder gives permission to other people or organizations about using, copying, and distributing their work for purposes beyond fair use. It puts in specific terms how a work can (and cannot) be used and specifies whether and how attributions should be made. 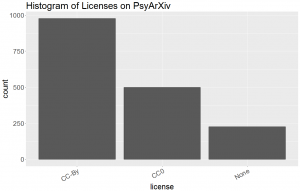 What are the licensing options on PsyArXiv? Although anyone can license work that they own however they’d like to and can indicate as such on their preprint, PsyArXiv supports two Creative Commons licensing options that will meet most posters’ needs. By default, works uploaded to PsyArXiv have no license, but a license can be added by the user anytime before or after submission. As described in more detail below, the two licenses PsyArXiv supports are: CC0 (specifically, CC0 1.0 Universal), which places work in the public domain, and CC-By (CC-By Attribution 4.0 International) which allows others to use and build on a work as long as they give the original author credit. As of April 17, 2018, the majority of PsyArXiv uploads have a CC-By attribution (57%) and fewer have a CC0 (29%) or no license (13%). What should I consider when making a decision about licensing the work I post on PsyArXiv? Typically, as psychological scientists, we want our work to be read, built upon, shared in full with others, and used to develop tools or interventions. Most of us also expect and assume that when someone describes our work, shares it, builds on it, or otherwise uses it, they will include a citation and perhaps a link to a URL where our work can be accessed. These preferences and expectations fit well with a CC-By license, which allows you to retain copyright and get credit while letting other people use your work freely. In some instances, though less commonly for written work, we want people to use our work however they’d like, meaning that they can copy it in full, modify it, and profit from it without giving us any credit. These preferences fit well with a CC0 license, which puts work in the public domain. Works in the public domain belong to or are available to the public as a whole without being subject to copyright. What are the benefits of licensing posted work? In the absence of a license, readers must make guesses and assumptions about our preferences and expectations. Many PsyArXiv readers may reasonably assume that they can use posted work just as they use scholarly products in journals and other publication venues (fair use). Many of us don’t mind–and indeed want–people to use our work in ways that extend beyond fair use (e.g., distributing it in a coursebook for students). When this is the case and we do not license our work, we leave it to our readers to intuit our preferences and introduce ambiguity around the legality of dissemination, distribution, and reuse. When can I license my work on PsyArXiv? If you hold the copyright of a work you are posting to PsyArXiv (e.g., if you are the author and haven’t given rights to anyone else), then you can license it. If you have given away rights in part or whole, you may still be able to license it. Often, copyright agreements that academic authors make with non-open access publishers transfer ownership completely to publishers and give them the exclusive rights to a particular version of the article (e.g., the post-peer review, formatted version). Many such publishing agreements allow the authors to retain some rights, like the right to self-archive and the retention of copyright associated with the pre-peer-review version (i.e., the pre-print), in ways that allow the author to license the preprint as CC-By or CC0. Each agreement is different and additional complexities are introduced by other agreements authors may have made, for example, related to institutional repositories at their university. If you are uncertain about whether you can post or post and license a particular work–for example, an article that has been published in a journal–utilize the many free resources that can help you understand your rights (e.g., SHERPA/RoMEO, Creative Commons). Many institutions have legal scholars in the library who can assist you in understanding your specific copyright agreement, and who can help you modify copyright agreements or otherwise retain rights as desired before you’ve published your work. Thank you to Haley Walton, Outreach Coordinator for Open Access at Duke University Perkins Library, for consulting on this piece. On August 1st 2017, PsyArXiv was named the preferred preprint service for the APA. In their press release, the APA highlights the benefits afforded by our service, including open access and increased discoverability. We will also be working to develop integrated submission portals that will allow submission from PsyArXiv to APA journals and vice versa. Once in place, this will allow users to easily submit the latest version of their preprint (and associated supplemental material) from PsyArXiv to journals and to solicit feedback on manuscripts submitted for review. This initiative is a substantial step towards openness and transparency by one of the most prominent organizations in psychological research, and we hope to facilitate similar steps by other publishers. The Center for Open Science is continuing to develop the functionality underlying PsyArXiv to facilitate usage by journals (regardless of the publisher) as well as individual scholars. The central mission of PsyArXiv is to provide preprint services to promote the broad use of this vital tool for open access to psychological research. To accomplish this, we are eager to work with a wide array of publishers to ease the workflow of individuals already using preprints and to enhance visibility of preprints to promote adoption for those who are not. We are excited that the APA has chosen to name us their preferred preprint service and look forward to many more similar opportunities. PsyArXiv (PsyArXiv.com), psychology’s dedicated Open Access digital archive, launches today. Today, PsyArXiv officially launches its open access digital archive, PsyArXiv.com, dedicated to psychological science. PsyArXiv joins a growing collection of online archives in fields including physics, biology, linguistics, and sociology, by providing a free, open access outlet for new findings in the psychological sciences. Like other scholarly archives such as Cornell’s original arXiv.org, PsyArXiv allows researchers to upload working papers, unpublished work, and articles currently under review (preprints), making them accessible to researchers and the public at no cost. PsyArXiv also permits researchers to share their work months or years earlier than usual, while also making it openly available to the public. PsyArXiv promises to create free, open access to psychological science, even for papers that are ultimately published in journals that are only accessible to subscribers. PsyArXiv provides support for multiple versions of a file, within-browser rendering of manuscripts, inclusion of supplementary files, data, and code, appropriate metadata, and links to resulting journal articles including DOIs. PsyArXiv’s infrastructure is provided by the Center for Open Science, which also provides simultaneous search of PsyArXiv and other preprint services. Details regarding future plans for PsyArXiv, including new features, can be found at this roadmap. PsyArXiv welcomes contributions from all areas of psychology, and hosts papers under review, working papers, and manuscripts that might be difficult to publish in traditional venues, such as replications of previous work or failures to replicate. Also, it allows researchers to update their files as their manuscripts benefit from community comments and the traditional journal review process. Researchers can upload papers and find out more about PsyArXiv at both PsyArXiv.com and on our blog, or can ask questions at info@psyarxiv.com. PsyArXiv, a preprint service for psychology, is up and running! It was created by the Society for the Improvement of Psychological Science (SIPS) and the Center for Open Science (COS). PsyArXiv is an interactive digital repository for papers on psychological science, serving two primary functions. First, PsyArXiv serves as an open-access archive for psychological publications of all sorts. This means that researchers and the public can access publications which might otherwise be protected by a paywall. Simply uploading manuscripts of already-published papers (in accordance with journal policy, most of which allow for sharing author-formatted manuscripts) increases the availability of scientific publications. In addition, PsyArXiv provides an outlet for articles which might never otherwise be published, due to null findings. The current PsyArXiv interface onto the underlying Open Science Framework (OSF) datastore is temporary. The full interface is under development, but PsyArXiv already provides a searchable database of preprints, with free hosting of manuscripts in perpetuity (ensured by a digital preservation fund). It is also easy to integrate a preprint with other supplementary materials through the OSF, providing open access to data, materials, etc. When PsyArXiv is updated, uploading and updating manuscripts will be even easier, with a DOI assigned upon upload. PsyArXiv will also allow commenting on preprints, with community moderation tools to ensure that comments are productive and helpful. Stay tuned for further updates! We are excited about the development of these useful features and more. For more information about why to use preprints, on how to post your own preprints to PsyArXiv, and more, be sure to check out our FAQ. If you have any other questions, you can email us at info@psyarxiv.com, or ask us questions on Facebook or Twitter. We would like to thank arXiv for the licensed use of their name. We would also like to thank the Center for Open Science for their hand in creating and integrating the PsyArXiv with the OSF and the new, upcoming preprint services in related fields. arXiv is a trademark of Cornell University, used under license. This license should not be understood to indicate endorsement of content on PsyArXiv by Cornell University or arXiv. A preprint is a draft of a scholarly manuscript made available to the public prior to publication in a peer-reviewed journal. Making one’s work available as a preprint has several advantages. First, it rapidly disseminates the findings of your research (it takes just minutes to upload a paper to PsyArXiv). Second, you can receive feedback rapidly and prior to submission to a peer-reviewed journal. This improves the overall quality of scholarship. 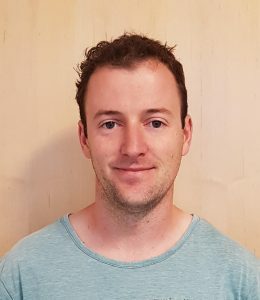 Third, preprints submitted to PsyArXiv are available to anyone with Internet access; this allows scholars, citizens, and businesses without journal subscriptions or access to academic libraries (including, importantly, those in developing nations) to access a version of scientific publications at no charge. Finally, preprints add transparency to the scientific process by allowing access to different (i.e., pre-review, pre-editorial) versions of a manuscript. Why upload to this particular archive? 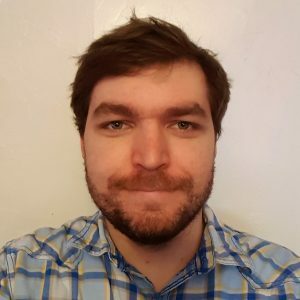 PsyArXiv is the premiere preprint archive for the psychological sciences, and it is run by a community organization – the Society for the Improvement in Psychology Science. The technology is provided by the Center for Open Science, a non-profit that many psychologists are already using to share their data and other materials. New features are coming, such as commenting, that we hope will promote a rich dialogue about cutting-edge psychological research. How do I submit a manuscript to PsyArXiv? Simply visit http://psyarxiv.com and click on “Add a preprint.” The site will walk you through a five-step process of uploading a new preprint or adding a preprint directly from the Open Science Framework. How do journals deal with preprints? Journals differ in terms of how they deal with the posting of preprints. Prior to uploading a manuscript to PsyArXiv, you should review the policies of any journal you are considering as an outlet (SHERPA/RoMEO is a database containing the policies of most journals). Usually, preprints that do not include changes made as a part of the journal editorial and reviewing process may be made available through PsyArXiv. In some cases journals allow edited versions of a paper accepted for publication to be made available on a preprint server; however, the publisher’s version (i.e., that which includes formatting, layout, etc.) will likely remain the property of the journal (and thus not available for posting to PsyArXiv), except in the case of open-access journals. Authors can also negotiate for permission to post their preprints using tools such as the SPARC Author Addendum. What were the motivations for creating PsyArXiv? PsyArXiv was founded in order to speed and improve psychological science. It was established to increase access to scientific findings and papers. Certainly all of us within academia, and a great number of the lay public, have encountered obstacles (paywalls, combing through overlapping search engines, etc.) in gaining access to articles. Such obstacles relegate access to some of the highest quality research to a privileged few. An insular, rigidly hierarchical science is a sick science. The current journal publishing system heavily emphasizes novel, positive, unexpected results. Studies which fail to meet this threshold are often left in the proverbial “file drawer.” Yet not disseminating null results is detrimental to the quality and caliber of published work as well as to the advancement of scientific knowledge. Preprint servers enable scientists to clear their “file drawer” in the same way they might have had such studies been accepted for publication. This informs researchers about boundary conditions and reduces the repetition of failures across many labs which, at present, simply go unrecognized. Such failures end up draining public funds and waste valuable time. Preprint servers also serves the aim of improving science by seeking to increase the quality of published work. The peer review process at most journals solicits feedback from two or three academics; in contrast, a preprint service offers the opportunity to provide and receive feedback from a broader range of academics, and can encourage feedback on the structure, presentation of analyses, and readability of a paper, in addition to the theoretical and/or empirical claims in the paper. This additional feedback can greatly improve the quality of work that is eventually published. Over the last several years, researchers, funders, and governments have increasingly recognized the need for more transparent and open science, both in the process of conducting studies and in that of disseminating results. More emphasis is being placed on attempting to replicate studies; individuals are encouraged or required to post their data and materials; analytic and methodological transparency, including reporting of null findings, has been strongly encouraged; and there has been increased recognition of the problems posed by the file drawer. All of these changes have culminated in an understanding that the current processes by which studies are discovered and, at times, disseminated stand in direct opposition to many of the aspirational goals of open science. Is this service a replacement for journals? PsyArXiv is not intended to replace journals. A preprint service is primarily intended to offer access to manuscripts before publication. However, in fields like physics and computer science, the popular arXiv.org preprint service (from which the PsyArXiv name comes) has become an integral part of the publication process. Posting one’s manuscript to arXiv greatly increases discoverability, meaning that one’s work is more likely to be seen, discussed, and cited. For science in the age of the Internet, the role of journals may become largely a way to collate research into relevant categories based on topic, discipline, or geography. However, formal peer review is an integral part of science, and journals play a critical role in facilitating this function.